I read in the paper that it was a good idea to put out a birdbath during this drought. My bowl was broken because it has been frozen and thawed to many times – I added a cookie sheet and a washtub to the old ceramic base – voila, water for some thirsty birds. 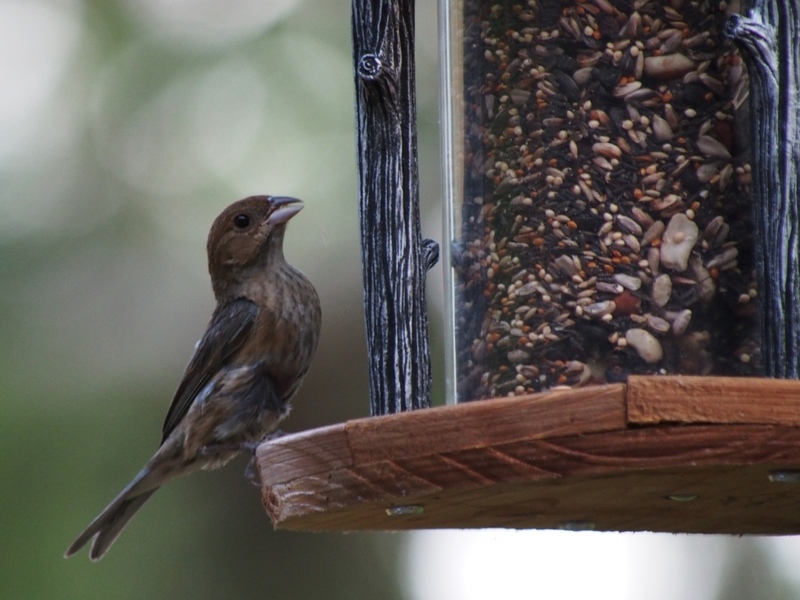 I have been challenging myself to shoot photos of birds this summer – so I thought I would pick up a feeder. This would set up some photo ops and I was thinking food must be scarcer too during drought conditions. 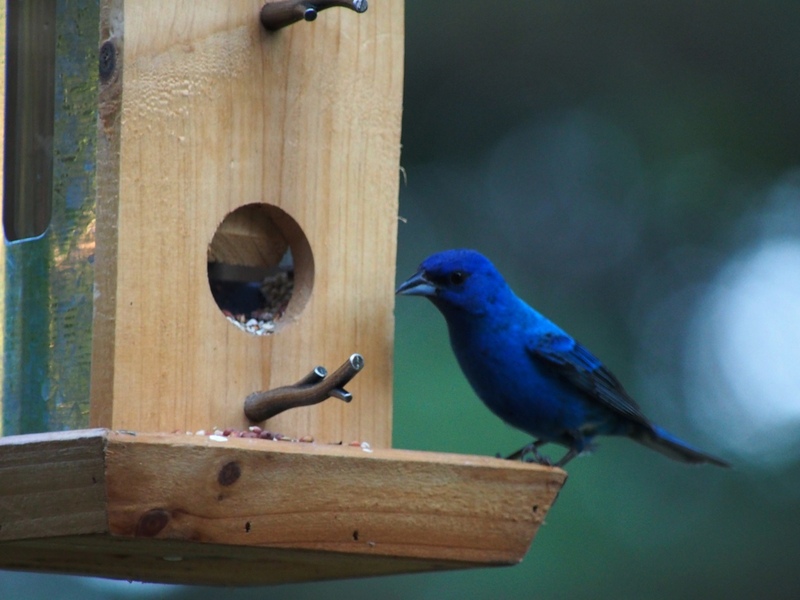 I picked a wooden one thinking it would look cool in photos and waited for the birds to land and take advantage of my hospitality. I have several pairs of cardinals living in the woods along my drive – maybe this could get them to come out where I could get a shot of them. Cardinals seem to be a bit shy. I would love to take some shots of cardinals up close and personal! 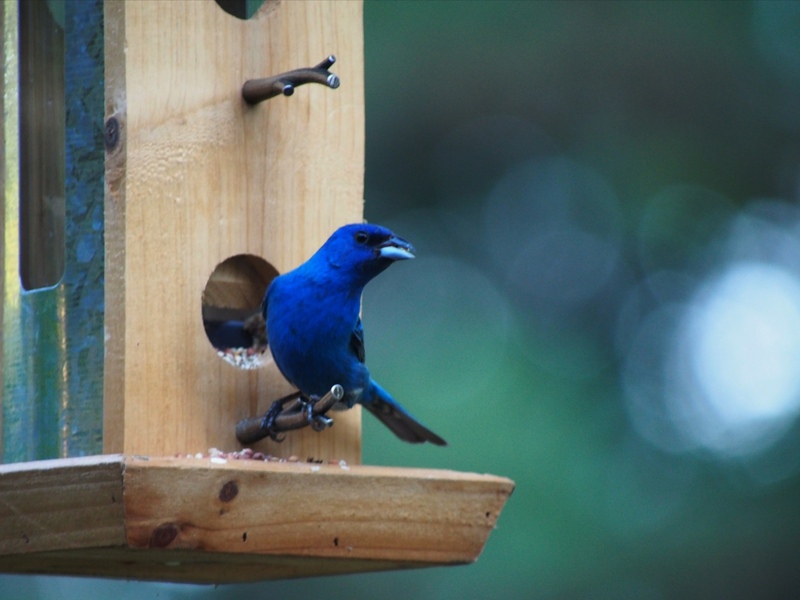 I love their color and shape – I’m helping wildlife and coaxing those cardinals close to the house! 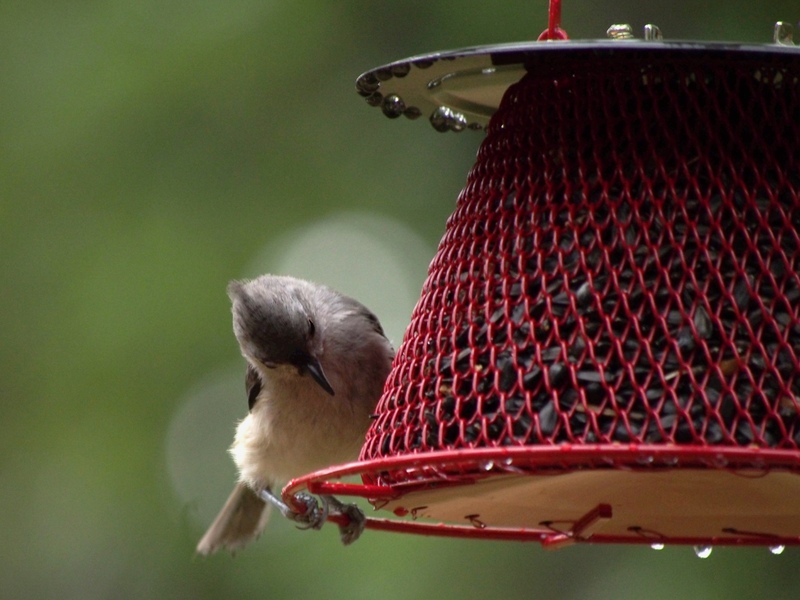 I hung the feeder. A day passed – no birds. A week passed, nothing. Two weeks, not a seed on the patio. 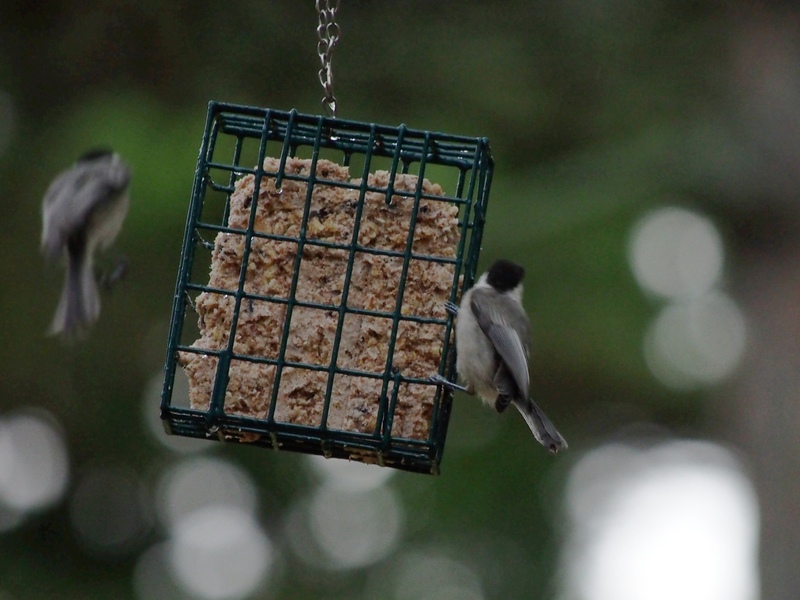 Finally, just short of three weeks there was a flurry of activity – dozens of birds vying for one of the perches. 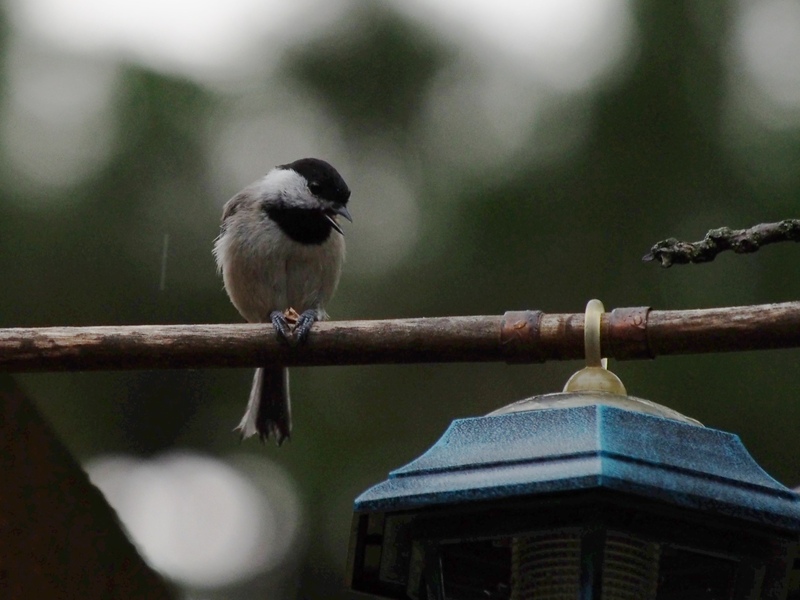 This bossy chickadee usually wins the battle for the perch at the bottom. The next week the same clerk told me that I needed some black oil sunflower seeds – cardinals can’t resist those! 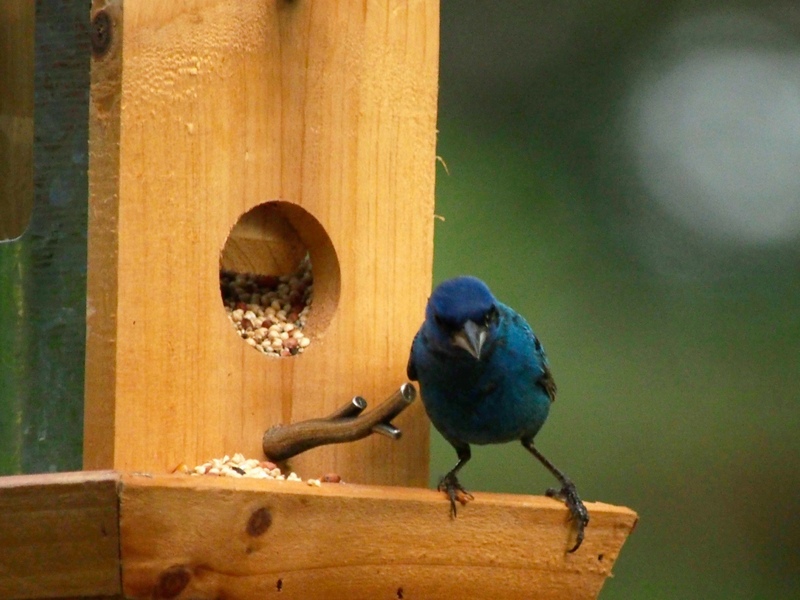 Of course you need a special feeder for this. So I picked one up – it’s cool and red and looks like it’s made of chain-mail. So now I have 3 kinds of food in 6 feeders. The birds are eating like crazy! 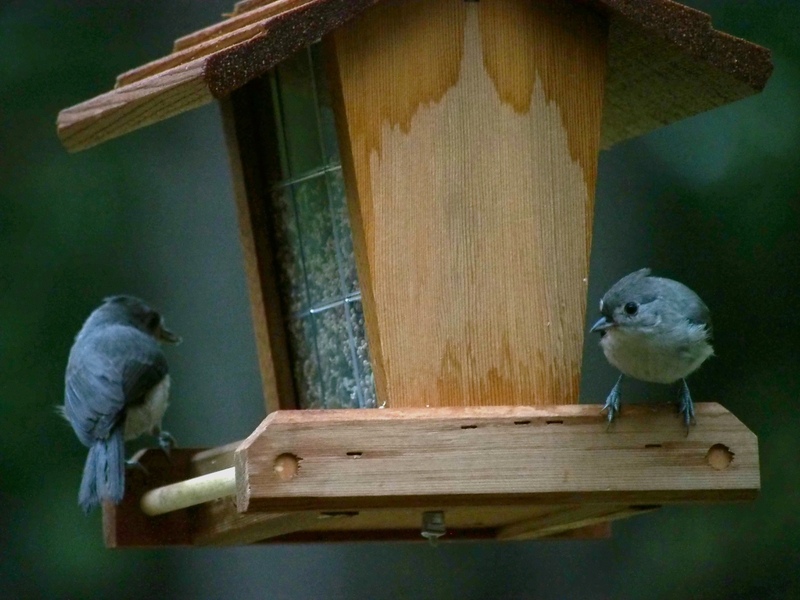 Cardinals don’t seem too impressed the new feeder though. I stop into the hardware store to pick up some seed and see a bell shaped block of seed – I think this will be a excellent addition and will be a great spot to get cute photos of the birds – it looks just like one ones you give a parakeet only super-sized! 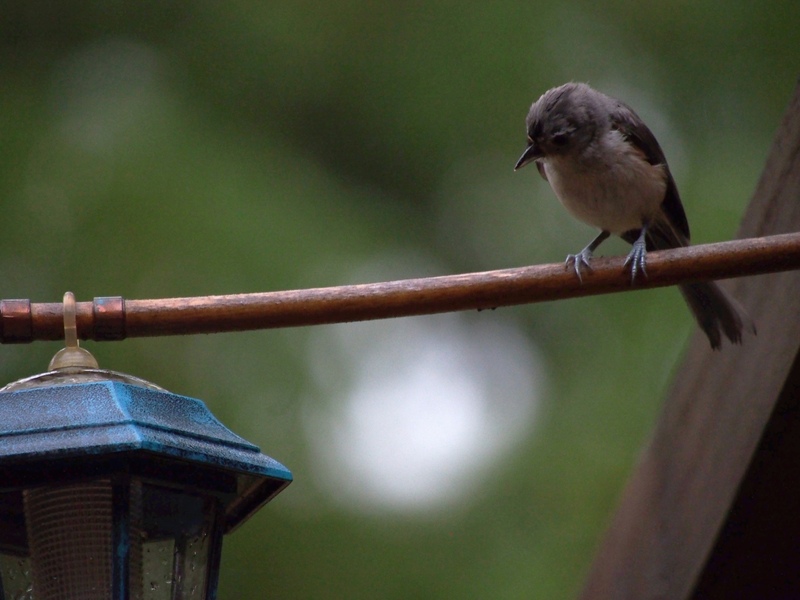 I know I have blue jays, but they seem to stay just out of reach. The clerk tells me the key to attracting them is to get a peanut feeder. So I oblige. 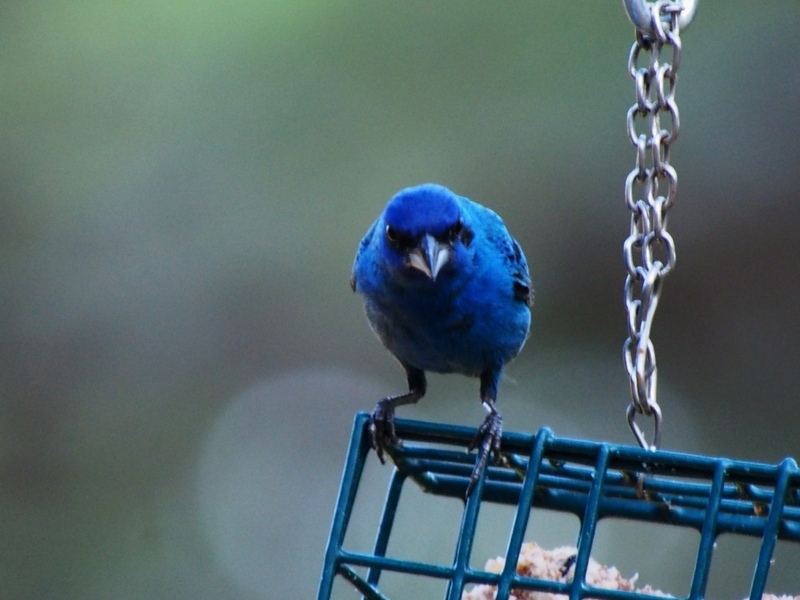 I also love peanuts and these are pretty tasty – the jays are in for a treat. Unfortunately they are not at all interested in hanging out on the porch with me at the buffet. Honestly, I think I’m the only one eating peanuts. 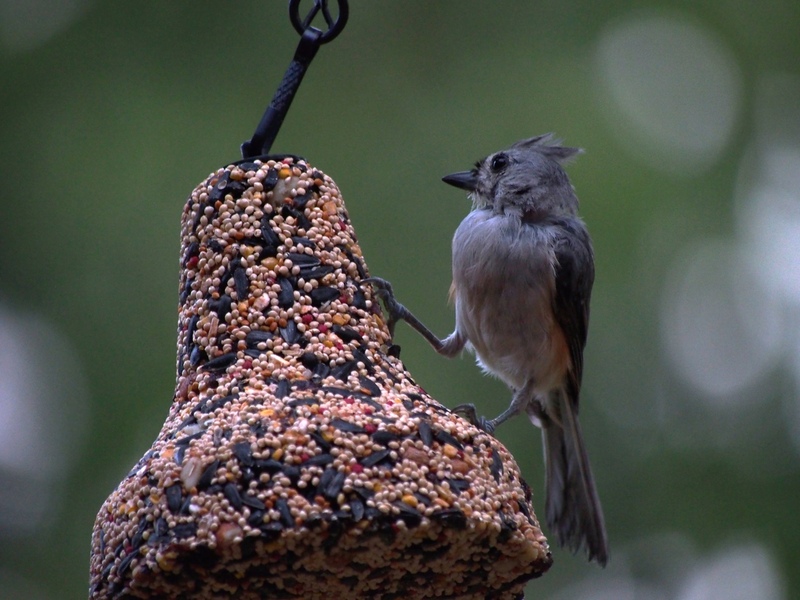 This titmouse tried for about 15 minutes to get one out of the feeder and gave up. 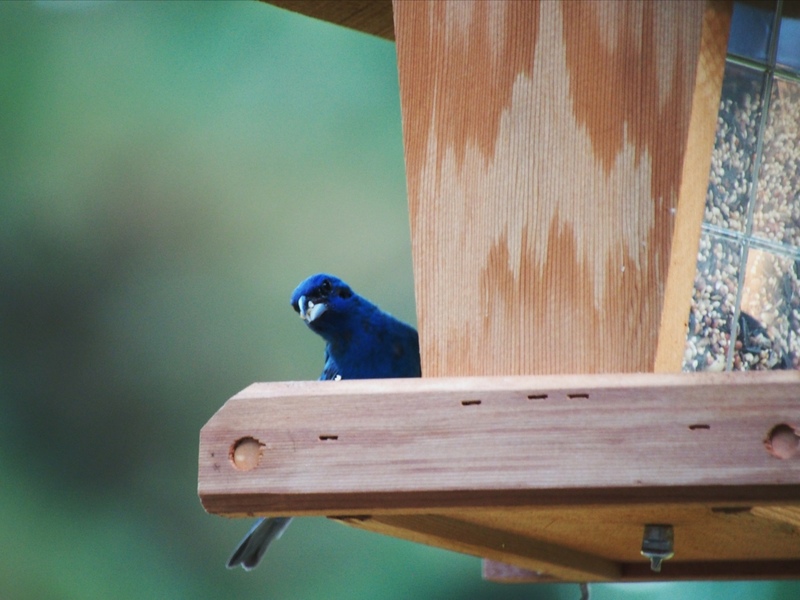 Last week I decided to go to Lowe’s to see if I could pick up some birdhouses. 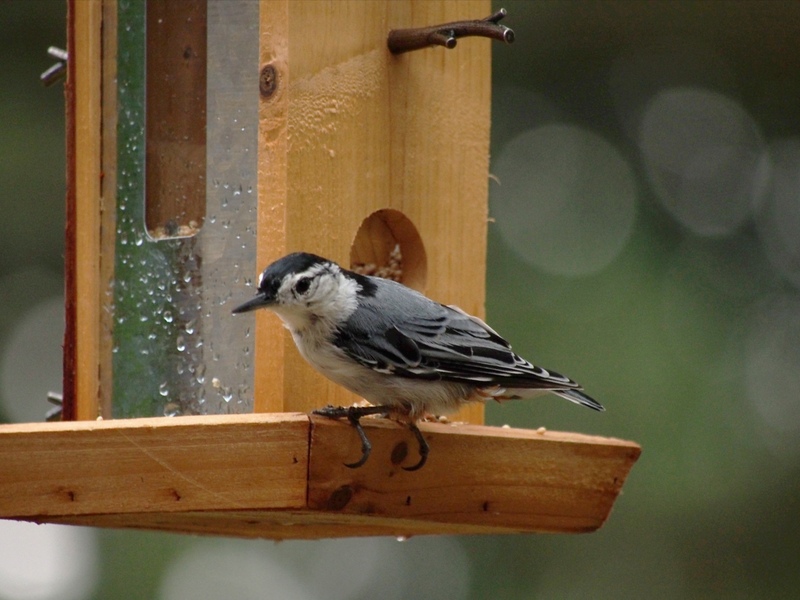 I heard that birdhouses will encourage the birds to settle in and stay close to the house – I put up 4. 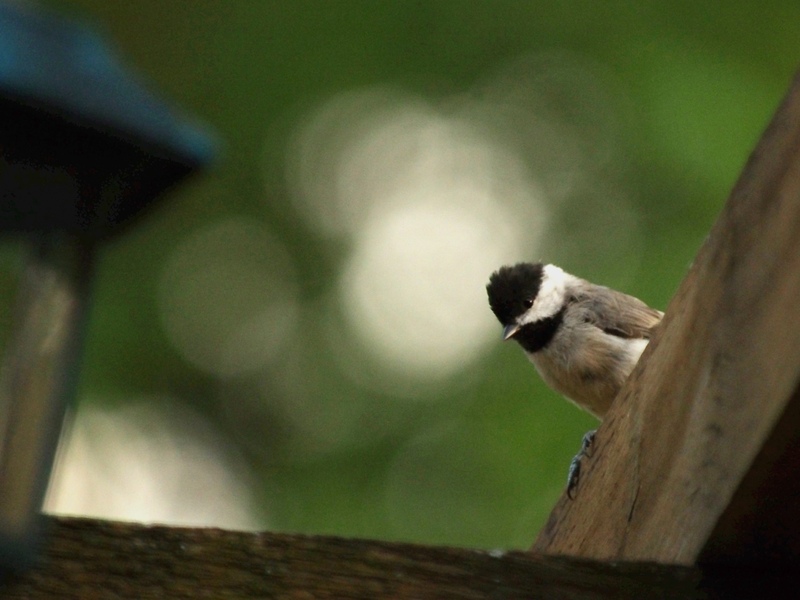 Of course the cardinals could care less and the jays look down their beaks at them, so far nothing has taken up residence. 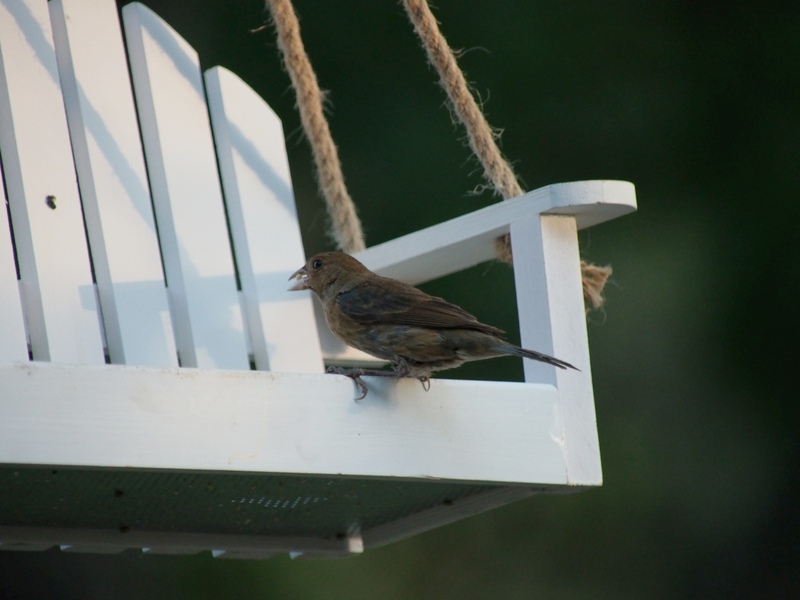 I stocked up on all 4 types of bird feed and saw this cute little swing – what a cool idea and it should look great in photos – plus I can put berries in it to attract cardinals! Not. Seriously, I love the swing and so do all the birds except cardinals. 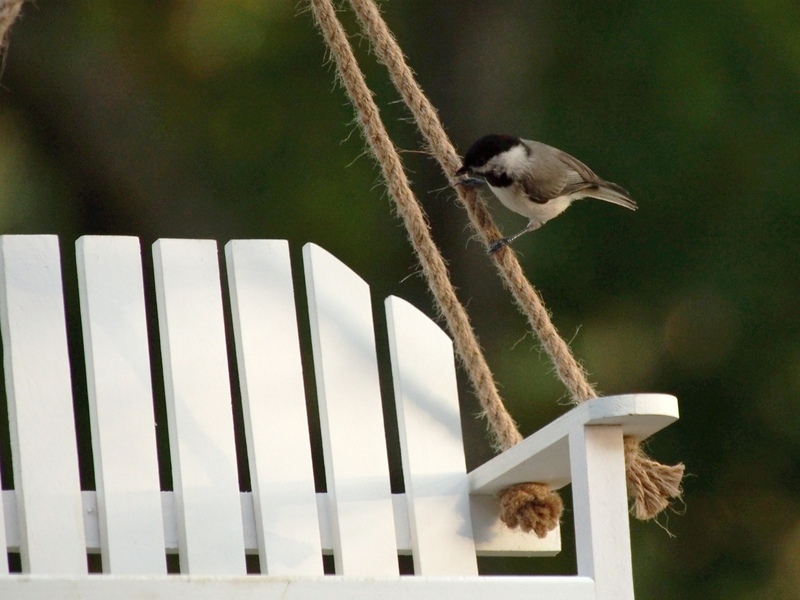 So now I have 4 birdhouses, 9 feeders, 4 types of seed and suet, berries, and I have bought enough swing set chain to outfit a large public playground. Cardinals and jays aside – was it worth it? Take a look at some of my new friends and decide for yourself. 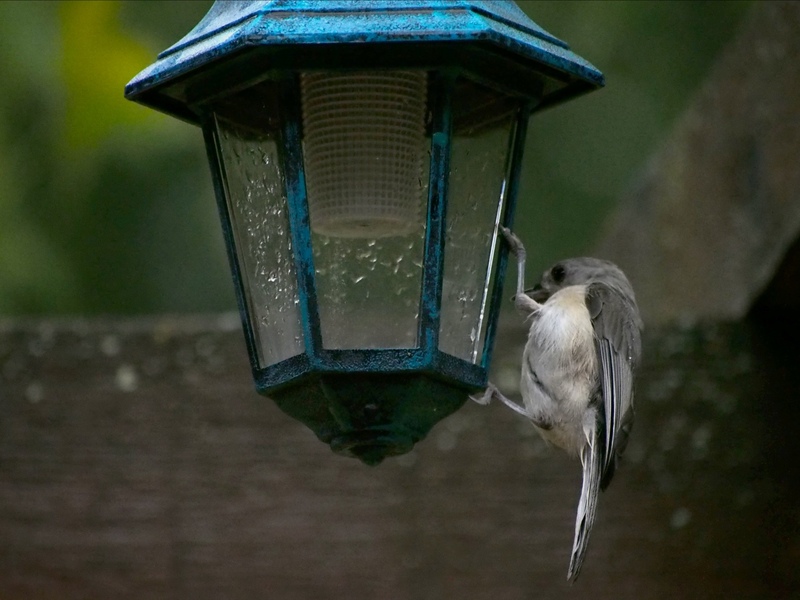 This guy is sure this solar light is another feeder – like I need another feeder. 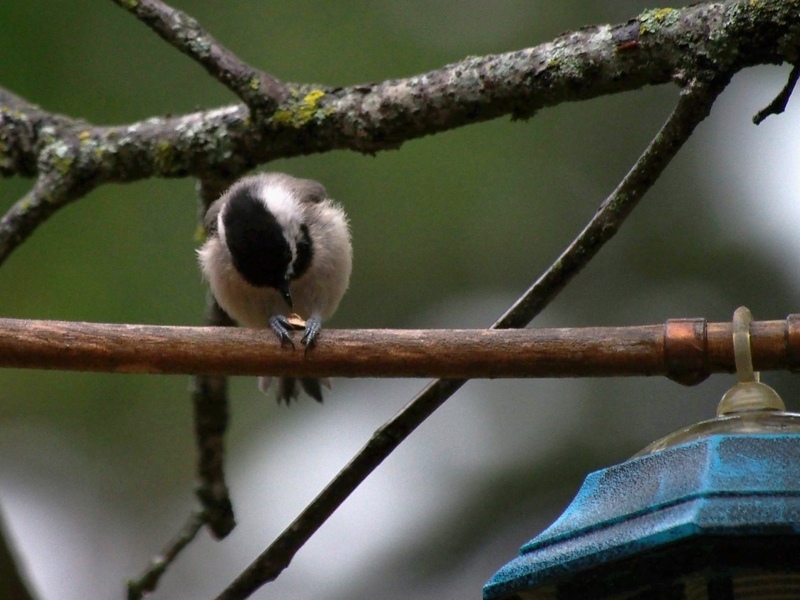 He has learned that tapping the plastic on the other feeders makes the seed come out – on the solar light all he gets is noise. 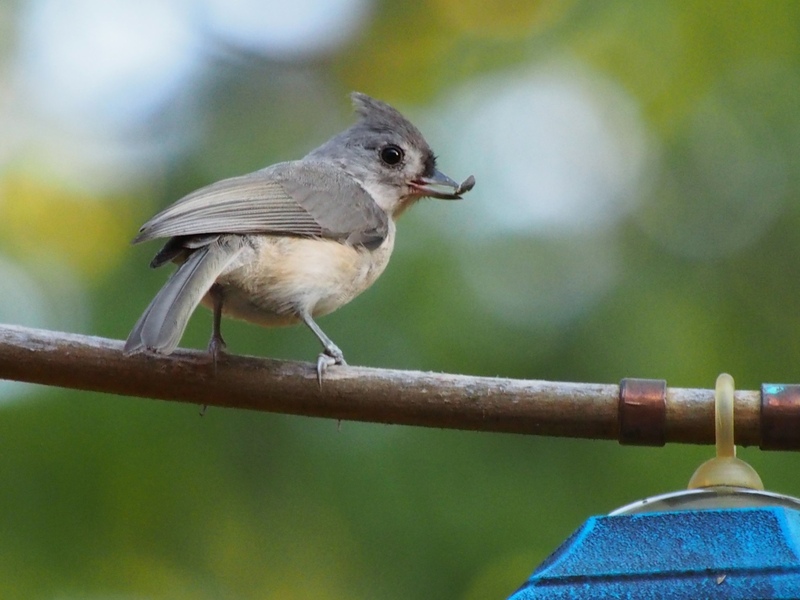 Titmice also hold seeds in their feet to crack them. I call this guy Blue Legs. This guy is tougher to catch. He darts around a lot. 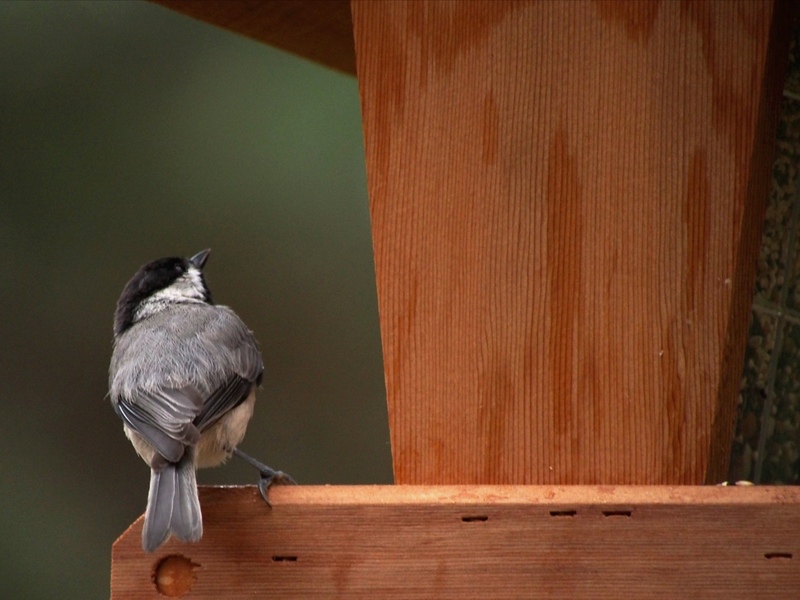 I thought he was a tall chickadee at first, he tends to crawl across vertical surfaces instead of flying and he likes to walk upside down. 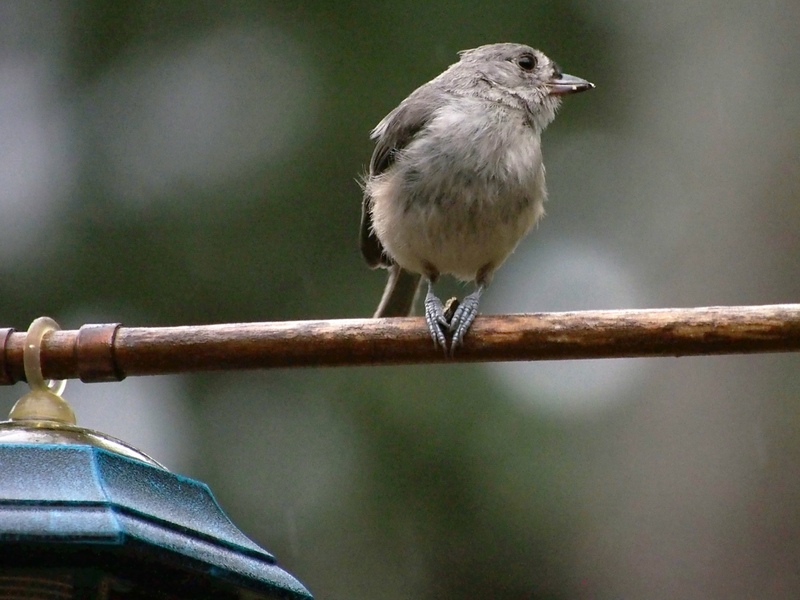 Buntings are a bit shyer than the chickies or titmice. It took several days of sitting inside my mudroom barely moving for them to decide it was OK to eat with me there. There are two pairs. 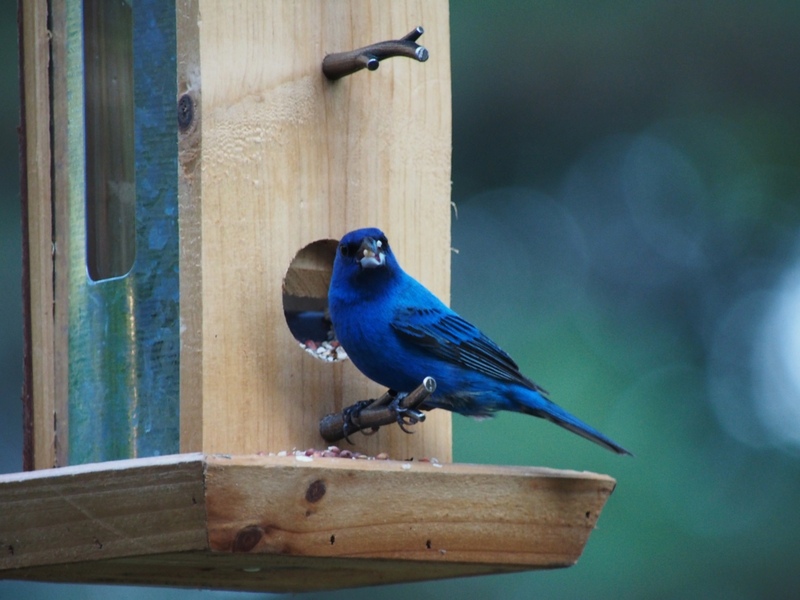 The males are a brilliant blue and the females are brown. 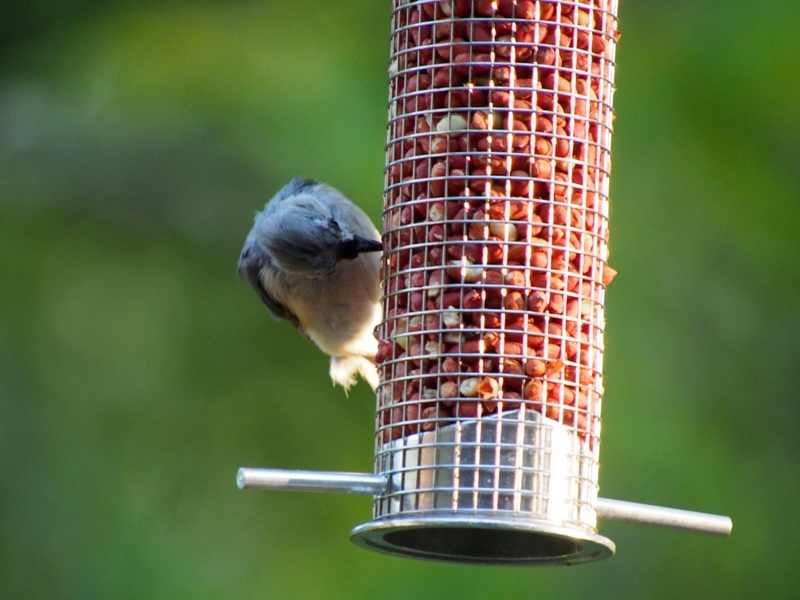 The females spend a lot of time foraging on the ground while the males prefer the feeders. This is Shifty – he has a hole on his left cheek. It doesn’t appear to bother him. He shifts from side to side when he spots me. I am totally intimidated. This is Not Shifty. Not Shifty is far more comfortable with me and throws me poses right and left. 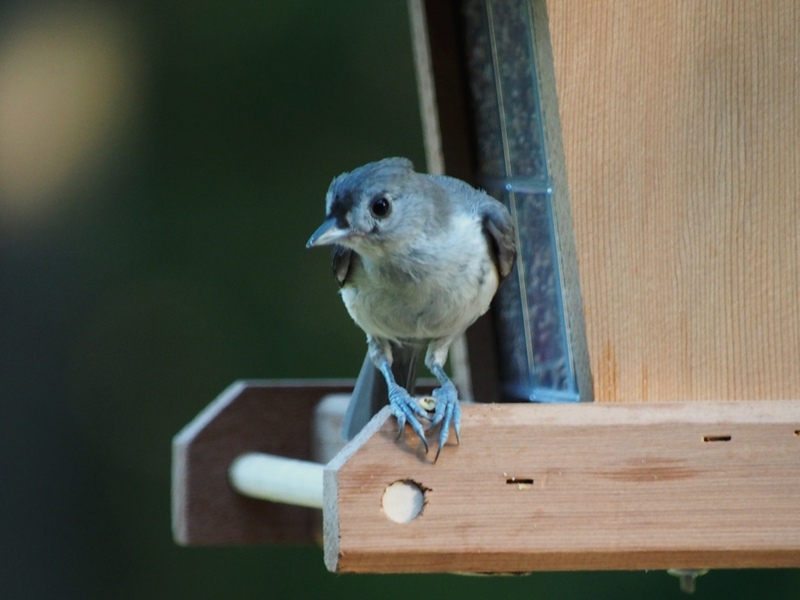 Finally, this is Not Shifty’s Girl – a rare shot of her at a feeder. It’s hard to get shots of her that are interesting on the ground because she’s pretty much the color of the ground. 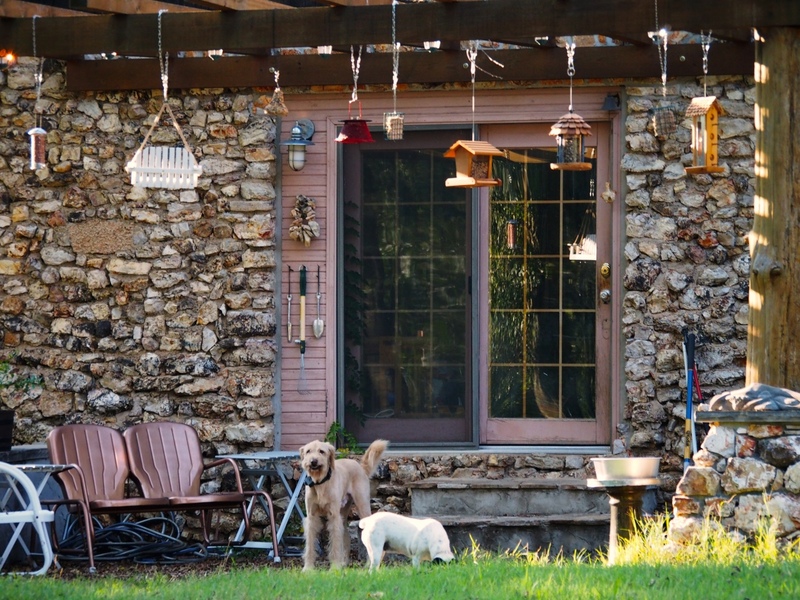 I’ve decided the cardinals can just stay in the driveway. If my buffet is not up to their high standards I’m happy to entertain the diners who stop by every evening. I keep the water fresh and the peanuts are outstanding! 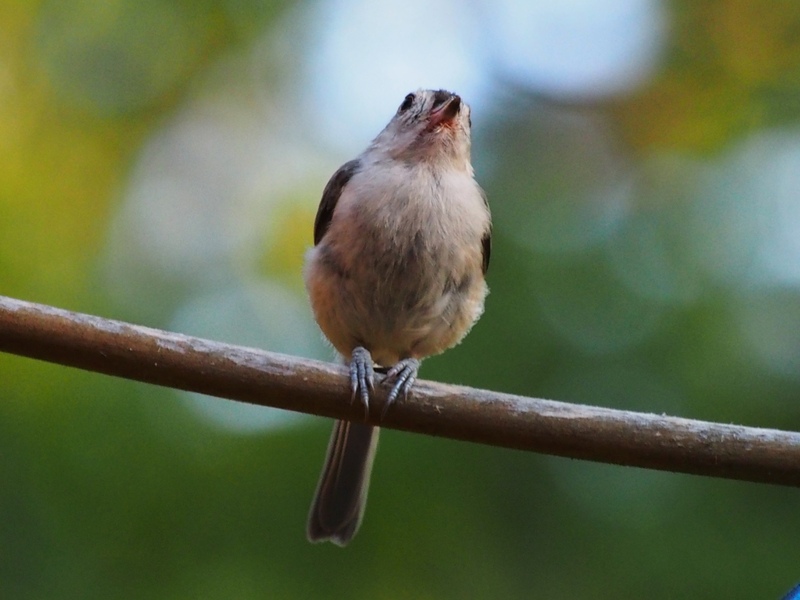 This entry was posted in birds, Ozarks, Photography, wildlife and tagged Arkansas, bird feeders, birding, bunting, cardinal, chickadees, Ozarks, photography, titmouse, wildlife by artsifrtsy. Bookmark the permalink. My my they are all sooooo adorable ❤ ❤ <3!! 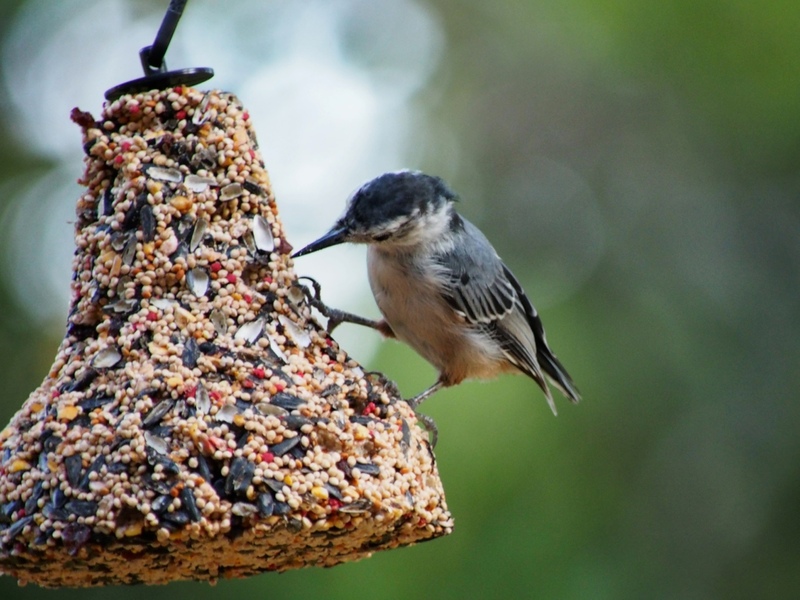 I know – I think I’m more addicted to birds than feeders 🙂 thanks for the reblog! 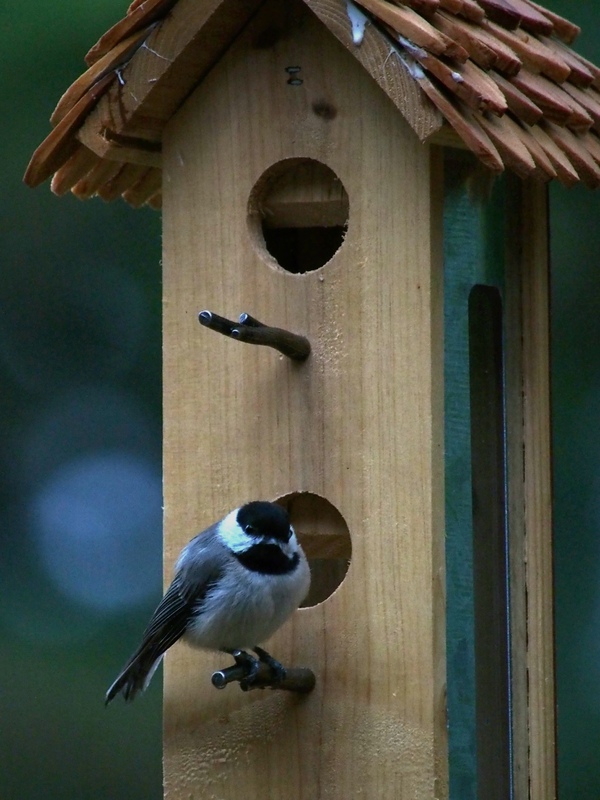 Holy Birdhouses Batman – Love Your Photos – thanks for sharing! Have a Great Weekend! Thanks Craves! You have a great weekend too! Wow what dedication! Lovely pictures, thank you for sharing them! Thank you for taking the time to check them out! 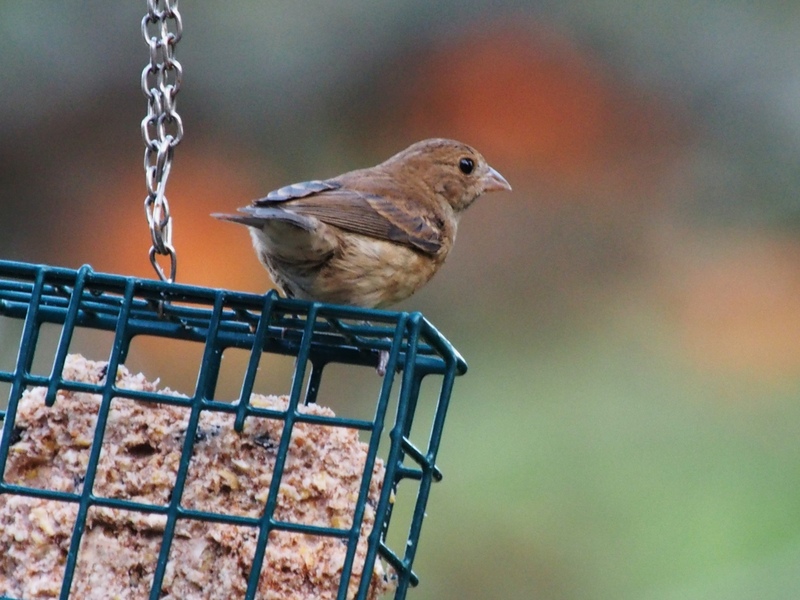 A friend just let me know that if I get a 10th feeder that I can attract Goldfinches! Is there a support group for birding addicts? I know – they crack me up when the show me their profiles. Thanks Jen! He is such a poser. Can you tell the doodle is smiling. He loves the birds. Such a goof. I loved that! What a great way to make friends! Thanks – I’m thinking they are like low maintenance pets.